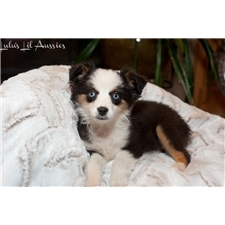 *Champion Bred Black Tri Male "Aspen"
This Miniature Australian Shepherd nicknamed Aspen sold and went to a new family. This little guy is just darling. He is getting the cutest freckles and has amazing dark copper accents. Prim Rose has darling babies with rock star personalities. This little guy is following in suit and he has a dynamite personality already. He looks like a standard Aussie in a much smaller package. We would like to offer this special puppy up to a very special home. He seems to have neurological issues which affect him in no other way than shakes/tremors. He is playful, loving, and your typical 8 week old active lil dude. Please call to discuss this special boy and if you may qualify to own him. I offer a full health guarantee, his parents are tested which makes him clear for PRA-prcd, MDR-1, HC and CERF clear! This ensures a healthy puppy and life-long companion for you and your family. Ready for your furever home now! You won't argue with my price... call/text/email me now to discuss.